All our log deliveries come in two size loads; 1x or 2x overfilled .85 cubic metre bags. What’s a .85 cubic metre bag? Deliveries are made in our equivalent to large builders’ bags (the ones you might see filled with sand or aggregate on a building site or outside someone’s house) which are approximately .85 cubic metres each. Please note that when your logs are unloaded, they’ll be in a loose pile. 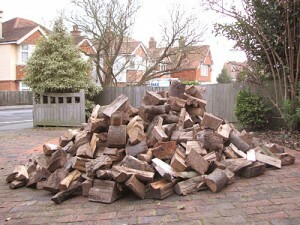 When your logs are stacked, they’ll take up a lot less space than when they are delivered. How many logs do I get? 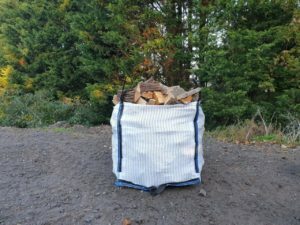 It’s hard to say exactly how many logs you will get in a two-bag load, but we reckon you’ll usually get about 450-550 logs. Do you do smaller bags? Our smallest delivery is one of our .85 cubic metre bags – anything less than that means it’s not economically viable for us to deliver without having to charge extra.